I'm not a big fan of splitting trip reports in several parts, but before I head off into the wild for my Professional Examination on Tuesday & Wednesday I wanted to give you a first taste of the paddling expedition. Expect Part II sometime soon! 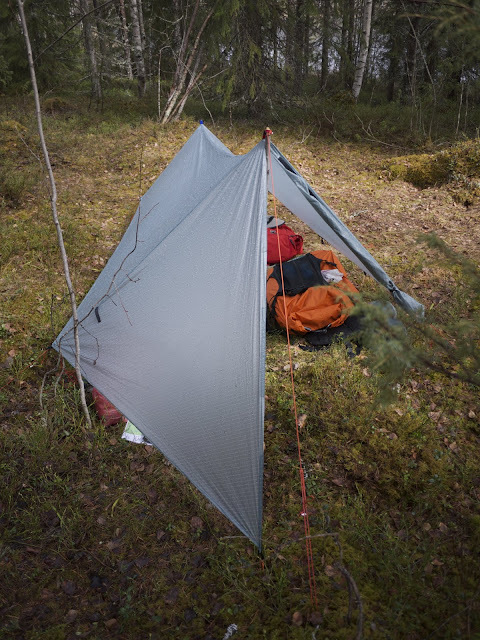 The fourth and final expedition of my Wilderness Guide education. 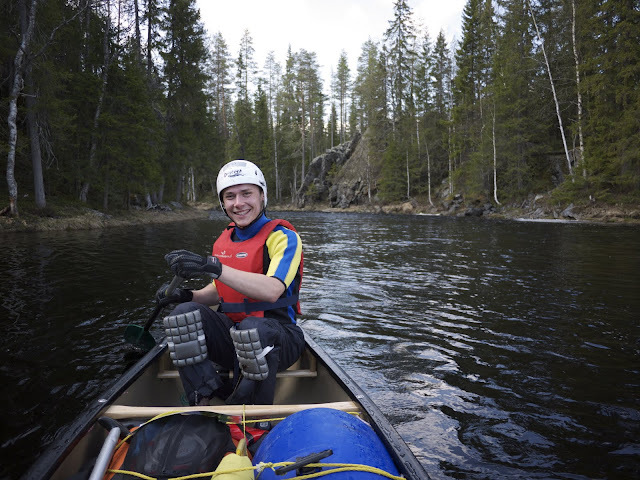 Paddling in canoe, kayak and packraft down some very scenic rivers and exciting rapids. Lots of learning, from a excellent teacher. Basecamp for the first four nights. 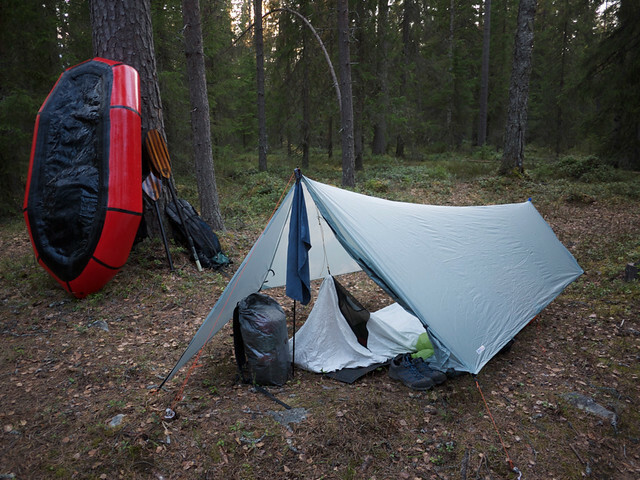 Monday morning, off to Kuru, throwing my pack into the trailer, climb into the car and off to the East we are. 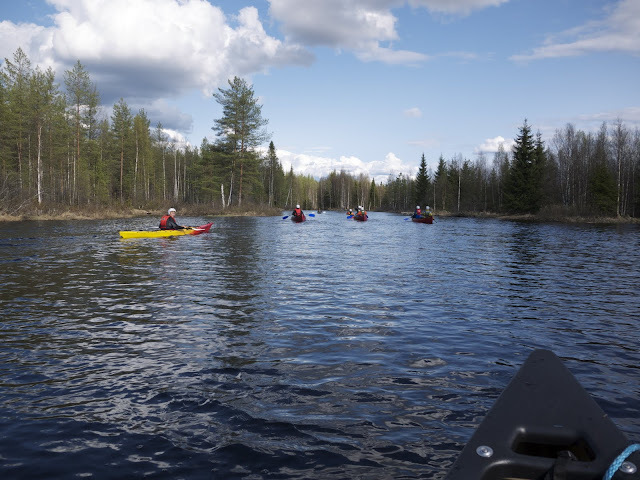 On the way we pick up our canoe & kayak teacher, Petri Leinonen - one of the best paddling teachers in this country, with over 25 years of experience. 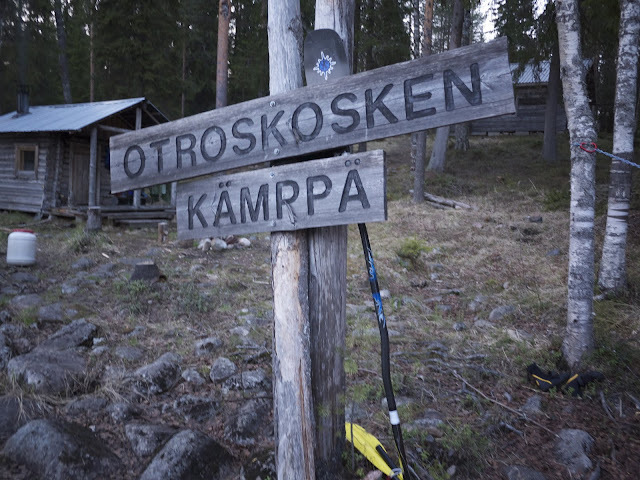 About six thirty in the evening we arrive at the Jonkerin Lähtöpaikka, basecamp till Friday morning. Here the river Jongunjoki starts, while the Jonkeri lake, from which it is fed, is our playground for the first days. Petri in the bow, refreshing our memories from last year. Tuesday and Wednesday we take turns in kayak, canoe bow & stern until what we learned last year is again up-to-date. 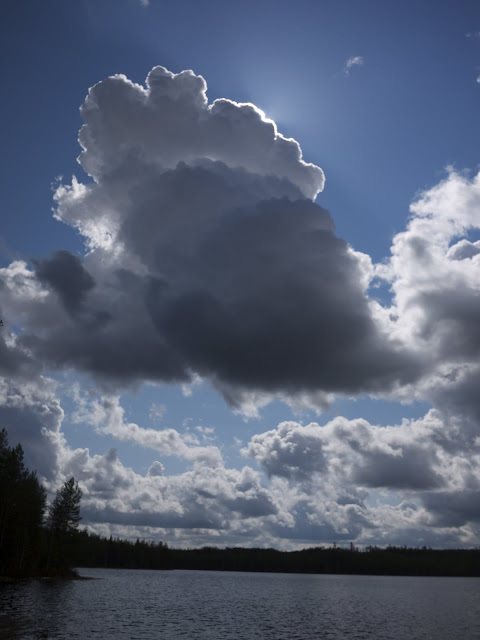 The weather is wet: grey, windy, rain, with the occasional ray of sunshine breaking through. 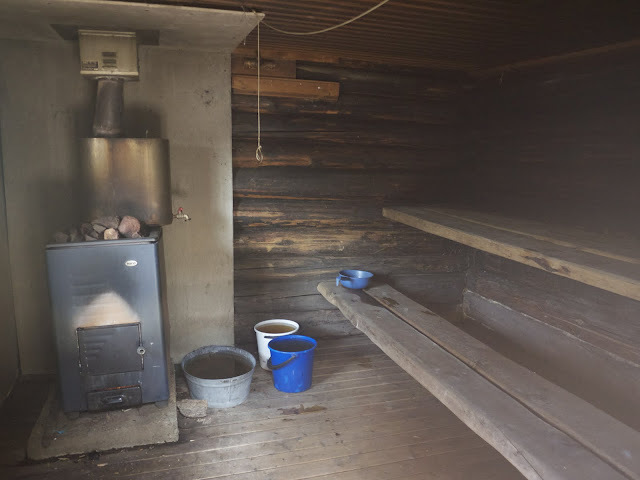 In every free minute we head back to the kota on the shore, a closed hut with a fireplace in the middle, to dry clothes, cook food and boil water for hot beverages while talking about paddling, and the soon to be finished year. Time flies, less than three weeks and this education is done. A Memorial site. Don't bother unless you get really excited about a big rock in a lake. This photo describes the general feel of the first few days pretty well. Tuesday afternoon we go to visit a few war memorial sites. 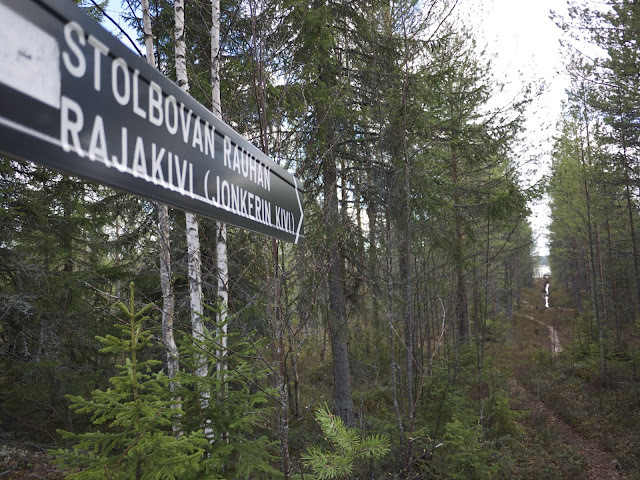 The rebuild trenches and bunkers near lake Saunajärvi are the highlight, we had good fun running around in them and "re-enacting" the war. Yeah, we weren't serious! 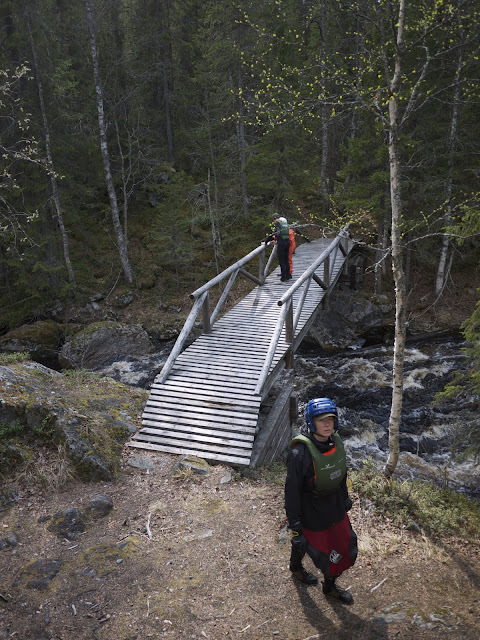 Wednesday afternoon then the first training at the Siltakoski rapid, a 70m long Class I playground. Managed to capsize in both canoe and kayak at my first try, which was a great learning experience - after capsizing you're not afraid of the water anymore, and you learn from your mistakes. Eddy turns and ferry gliding were the name of the game, and good fun after you mastered them. The Kota on the far left, behind it the woodshed, a hut we used for dressing & drying, and in the background another hut which we used to store gear. Thursday, second morning on the rapids. I got permission to take the packraft, and boy did I have fun on the short Class I rapid - I must have had a manic smile on my face, so much fun it was! Down and portage up were what I did a dozen times, ferry gliding across the current, working up the current into the eddy to do a eddy turn to go back down. Awesome. I want more. Our vessels. Brand-spanking new Esquif Prospecteur 17 Royalex canoes where what we were paddling, at 2000€ a pop not cheap! The Kayaks already had seen plenty of (ab)use. Thursday afternoon then a short introduction to something. It was raining, which wasn't bad, but the wind which was howling made us all look like a sorry bunch. Before it was go to sleep time, it was "Say what ya wanna paddle tomorrow" time. Kayaks were popular, and after some discussing and thinking a satisfying solution was found. 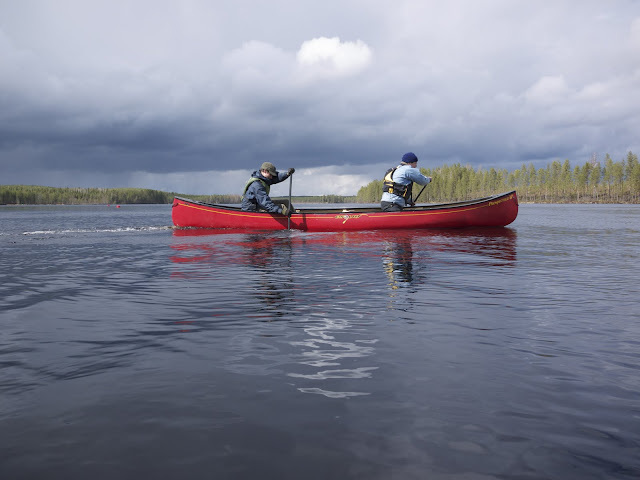 I was to paddle in a canoe with a good mate, someone of whom I knew that we would work well together. Off to sleep then. Thursday evening. Calm before the storm. Friday morning, breaking camp, packing, lashing gear into the canoes and kayaks. First time, so it took a fair amount of time for us 11 students. By eleven o'clock we were ready, and we started to paddle down the Jongunjoki. The first few rapids were short Class I, nothing to get out and go scouting for. There were some lakes to be traversed, thankfully it was fairly windstill so there wasn't much of physical effort involved. 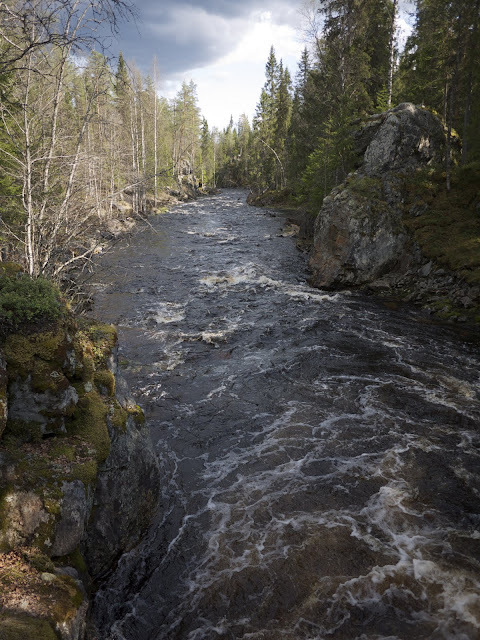 After some time paddling we reached the 550 m long/ 7 m drop Kalliokoski - Boulder Rapid - our first Class II rapid. Getting out and scouting, getting the lodown from Petri, getting back to the vessels, deciding who goes first, second, third... Building up anxiety. 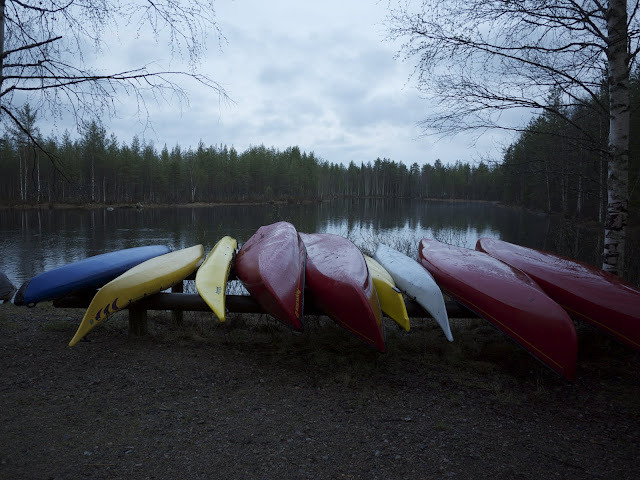 Waiting makes me nervous, and in a group of nine canoes and kayaks, well, expect to wait for a while. Thankfully we soon had a go, giving a 110%, being full of adrenaline we had a fine run down, big smiles after having mastered this first challenge. We continued to the lunch site, the sun came out and it was gloriously fine, laughter and smiles all around while we strengthened ourselves for the remaining 15 km. 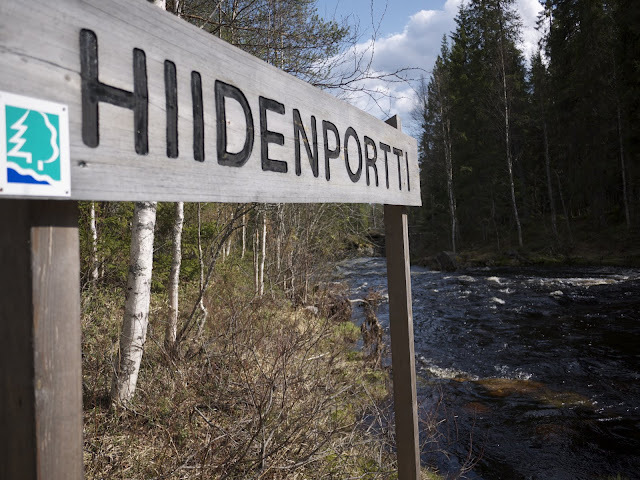 Hiidenportti, the second Class II+ rapid. Middle - scouting from the bridge. Happy paddlers after a perfect run! 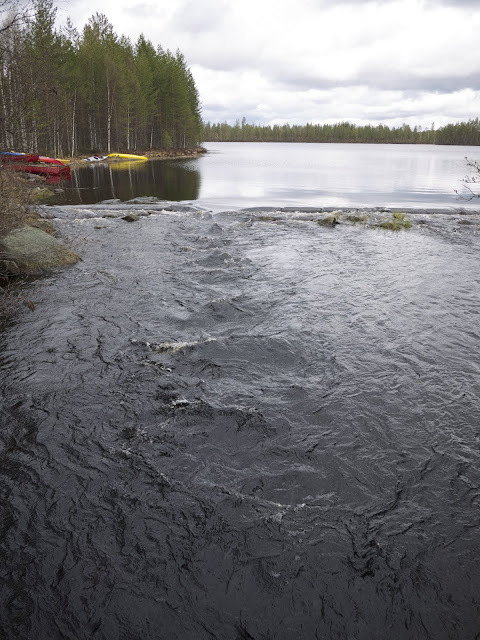 Hiidenportti was tricky also because there's not much leeway above the rapid - there's another Class I right before it, so it is backwards ferry glide across the current, eddy turn in and off you go. As you can see from the photos, my mate and me did it without getting wet, a sweet run, pumped with endorphines and being really happy about doing it so well. We waited for the rest of the group, had a little post-excitement drink and snack, before the paddling continued. Paddling continues after everyone came down Hiidenportti. 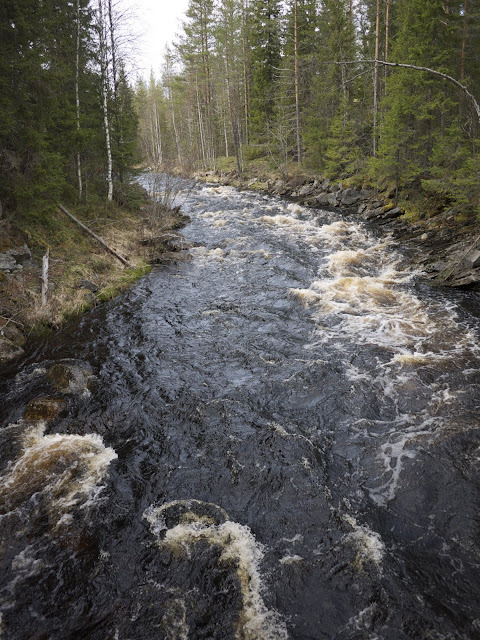 After Hiddenportti there were seven more rapids, of which only Pässipyörteenkoski with its one meter drop right at the beginning is worth mentioning. 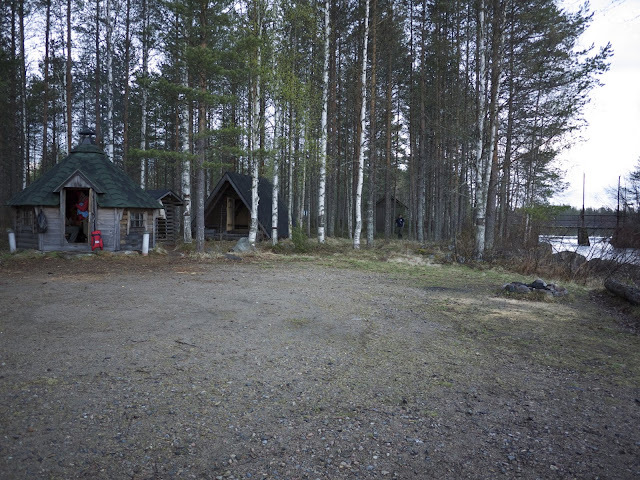 We arrived at the Otroskoski campsite, the (open & free!) Sauna already being heated by some other paddlers, ready for us later on. I asked Petri if it'd be cool to run the last few rapids with the packraft, and got permission for take-off. 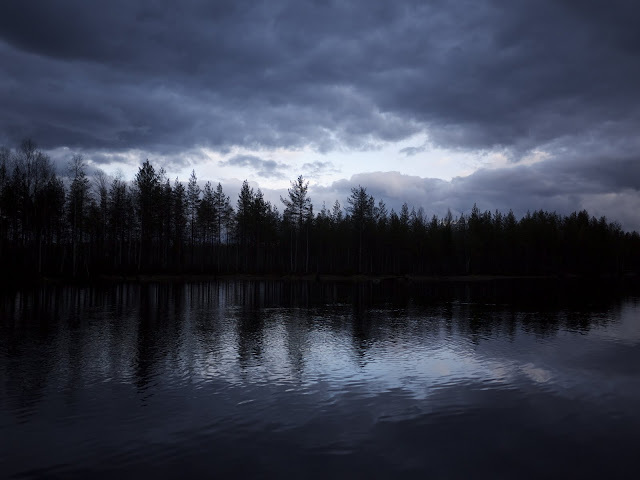 Wading through a contributory stream and bushwacking through the forest up along the stream, I reached after a while the V before Pässipyörteenkoski. Inflate, strap the pack to the Alpaca, PFD, Helmet, Spraydeck closed and off I went. Good fun, but sadly too short. Otroskosken hut (top right) & sauna. Plan a stop here if you paddle down Jongunjoki. 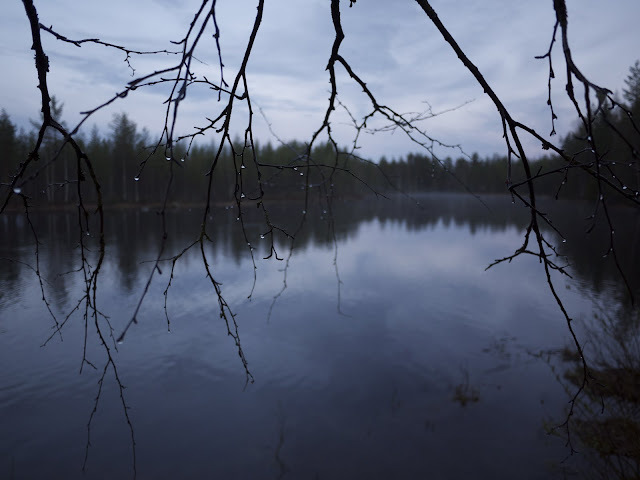 Camp that first night paddling. After having successfully run the river in the packraft I was just in time for the evening meeting, in which we discussed the past day and the next day. While I munched my dinner the sauna was getting ready, and a fine sauna it was. A dip in the river was the refreshment needed, before heading off to sleep & sweet dreams.